"Bruce" was easy to create. Select the size of watermelon you want to carve into a shark. Slice a piece off the bottom so it will sit flat. We wanted a large mouth to hold a lot of fruit. Draw a line for the mouth then cut it out. Once you have the mouth opening scrape out the inside of watermelon to save for later use. Now draw another line on the out side of the mouth. You will scrape the top layer of peal to reveal the lighter green. You will make the teeth just cutting triangles. Decide where you want the eyes. 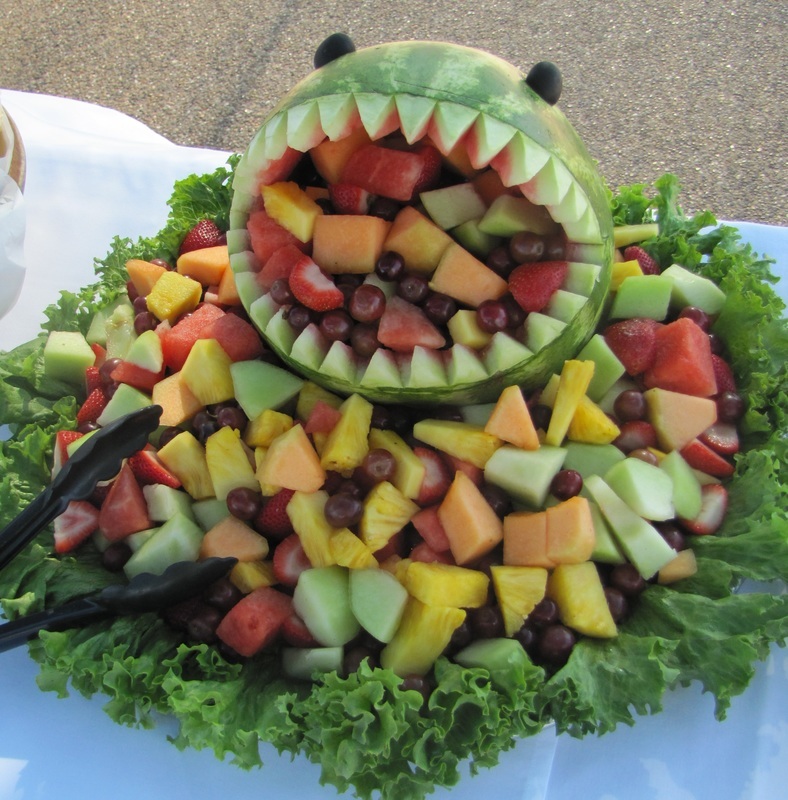 We used a melon scoop to make the eye sockets and we used black olives for the eyes. You can cut a fin from the bottom slice. Your done!!! You can fill it with assorted fruits. There are lots of videos on youtube that give great instructions. Creating cupcake toppers is quite easy with a die cutting machine. I used my cricut imagine to make the flamingos and sharks. I used the Life is a beach cartridge for the flamingos set at 4.5. 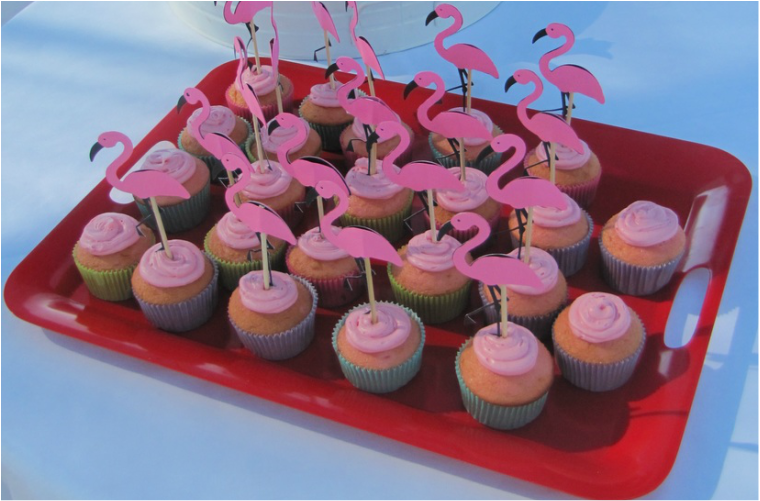 I made an extra back to secure the flamingo to the skewers. I used the Fun in the Sun cartridge for the sharks set at 4.5. Again I made an extra back to secure the shark to the skewers. For the tables we made painted pineapples. I got this idea from pursuitofshoes.com. You find pineapple with beautiful greenery and you use acrylic paint. Very simple but beautiful. 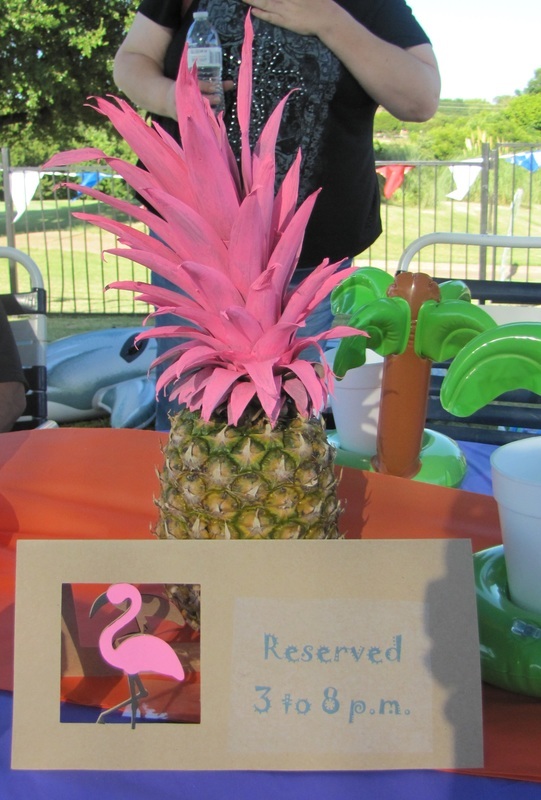 I also made the reserved signs for the table printing out the information and using the cricut to cut out the flamingo design.